Nodus Labs is a Special Agency that researches communities, communication, and social artefacts through the frameworks of complexity theory and network science. We operate in terms of the Special Missions that we designate and fulfil. The current mission is research and development of the interfaces for cognitive reconfiguration, which can produce evolution in learning. Those interfaces can be understood in a broad sense: from the actual tools and software to specially designed interactive situations, writings, workshops and events. We are the associate member of Gephi Consortium, homeschooling association Education Otherwise, and Association Performing Arts Forum. 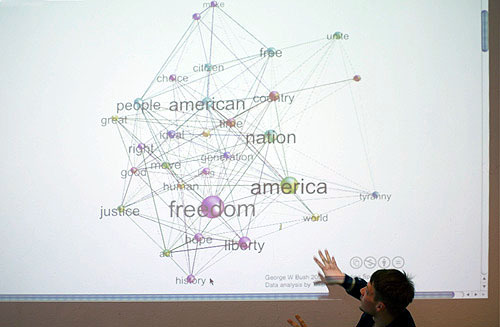 We created ThisIsLike.Com online mnenomic network used by thousands people to retain and share their knowledge, the first non-linear reading tool and text network visualization software Textexture, and the most recent learning and research tool InfraNodus. We also produce research and interactive situations that bridge sociology, network science, and arts, and we also offer regular workshops, talks and consulting services on these subjects. We believe that various interfaces (software, visuals, and – especially – human body) offer a much more versatile way to communicate ideas than what we currently know. Our intent is to learn to evolve and to evolve the learning. If you’re interested to collaborate, please, take a look at the services we provide and let us know where you can see a space for collaboration.